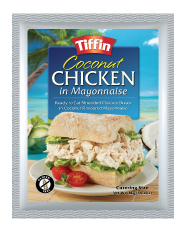 Our chicken mayonnaise products are specifically designed for the foodservice and catering industries, and are supplied in 1kg shelf stable pouches. 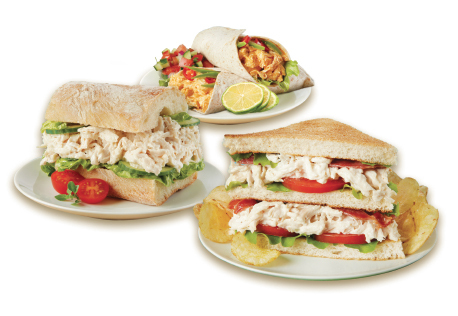 They are made with premium boneless chicken breast, are available in three flavours, and are perfectly suited for use with wraps, sandwiches, subs, pizza and salads. All products are gluten and MSG free, with pouch packaging that is shelf stable for up to 12 months. 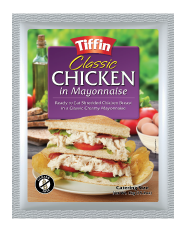 Ready to eat shredded chicken breast in a classic creamy mayonnaise. 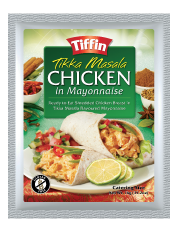 Ready to eat shredded chicken breast in Tikka Masala flavoured mayonnaise. Ready to eat shredded chicken breast in a coconut flavoured mayonnaise.